Are you not getting a good night’s sleep because of persistent neck pain? It can be disruptive, and we know what it’s like. Cervical pillows can be the solution to alleviate that pain. They are ergonomically designed pillows that aim to relieve pressure by providing full-contact support to your neck (specifically, the cervical vertebrae). Even if you don’t have neck pain, this type of pillow are made to support your head and neck in ways regular flat pillows cannot. In this buyers guide, we look at what makes a great cervical pillow and recommend the best ones for you. 2 What Makes A Great Cervical Pillow? The TAMPOR Pillow is a very light-weight value-focused cervical pillow. One of the problems with memory foam is the smell that comes with it for the first one to two weeks of unpackaging. TAMPOR fixes this in their memory foam pillow by combining it with both bamboo and charcoal to deodorize the pillow, making it both an air purifying pillow and highly breathable, wicking away moisture to help provide a cooler sleep. Definitely a very unique filling used for a cervical pillow. The TAMPOR has a very slight wedge that goes underneath the neck for support, with a contour cervical support and side supports to relieve neck pressure and maintain head position during sleep. The pillow can also serve for side sleepers with side panels that have contoured support as well. There are two parts of the cover: we have the cotton fabric lining that is not removable to protect the bamboo charcoal memory foam pillow, and the jacquard cotton fabric cover that is zipper removable for machine wash and drying. Overall, we love the simplicity design of the TAMPOR Pillow. It isn’t as thick as the other cervical pillows we recommended, which gives it a nice spot on our top 5 list. The bamboo and charcoal blend with the memory foam is a huge benefit in our books, as bamboo is well known to wick away moisture very well while allowing good airflow. Charcoal on the other hand deodorizes the memory foam and also helps purify airflow throughout the pillow. You can find charcoal is a common ingredient in water filters. The memory foam is dense, and conforms well to the head and neck. You can also sleep on your face and belly if you rotate the TAMPOR because of the thinness opposite of the cervical support side. For its price as well, you can’t go wrong with the TAMPOR Pillow. The Arc4Life Pillow is a cervical neck support pillow that uses a ‘V’ shape design to cradle your head, with thick plush side wings for side sleepers. We are a huge fan of the “Traction ‘V'” wedges because they help keep your head cushioned along the sides to prevent rolling. The V-shape design helps push the weight of the head and neck towards the center where it is better supported, reducing pressure along the sides of the head. 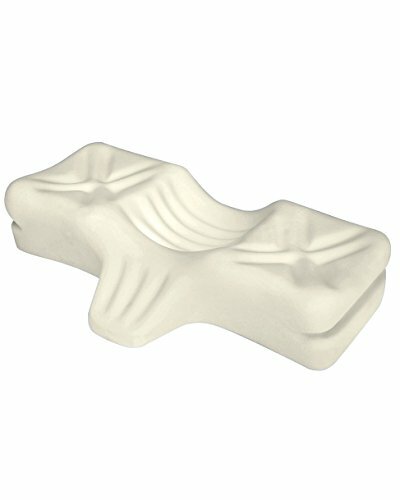 The pillow’s design is unique in that it restores your neck’s natural c-curve of the cervical spine as you sleep. The gentle positioning of your head slightly away from your shoulders lets you lessen morning aches and pains while providing you with better blood circulation, too. The pillow uses 100% polyester fiber filling to give it a soft, fluffy feel. Overall, it is a very unique pillow shape. A standard pillowcase will fit well over the Arc4Life. It does take a few days to get used to the pillow, but we love it. The roomy side flaps also give us additional sleeping ideas whenever we want to mix it up. The pillow fillings can shift around so the occasional fluffing from time to time fixes that. The Arc4Life Pillow is also machine washable and dryer friendly. 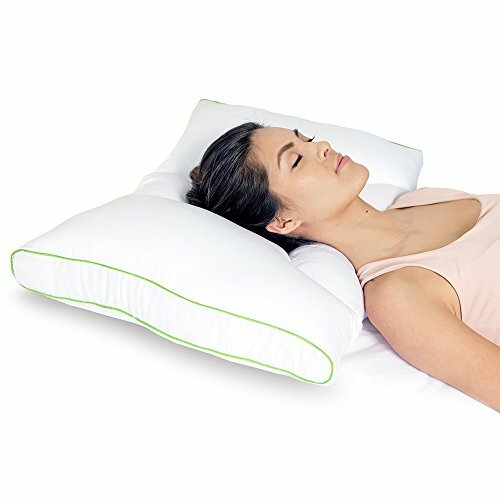 The Therapeutica pillow is another uniquely designed cervical pillow. It is designed with both back and side sleepers in mind, with a cavity, contour, and wedge extension in the middle to support back sleepers, and side panels that are thick to support the heads of side sleepers. Our first impression of the pillow is that it was on the firmer side of pillows. Admittedly, we were afraid of its very different design as a pillow for sleeping. You’d think a pillow for resting on your bed should be at least square and puffy. We were pleasantly surprised by how well it supports our neck during sleep. For those who need a softer pillow, the Therapeutica may not be the right one for you. However, it is well cushioned using 100% polyurethane foam which uses an open-cell structure and is less dense than memory foam pillows. There are also five sizes available for the pillow, and Therapeutica emphasize the importance of picking the right one. They offer a guide found here where you can either print out a custom ruler they make or measure yourself and compare it to their measuring chart on their webpage. Overall, we love the pillow both as back and side sleepers. The cavity with its cervical contour and wedge extension support places our head in a comfortable angle that relieve a lot of pressure along our shoulders and upper back. The wedge extension also takes off a lot of pressure along our neck and base of our heads. The side panels with their slight cavity elevate the head at the right level and relieves pressure along our neck and shoulder muscles. No complaints! Also, a standard pillowcase fit the Therapeutica. 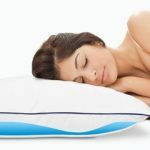 The Sleep Yoga Pillow was designed by a chiropractor, sleep product veteran and industry designer to be a versatile pillow. 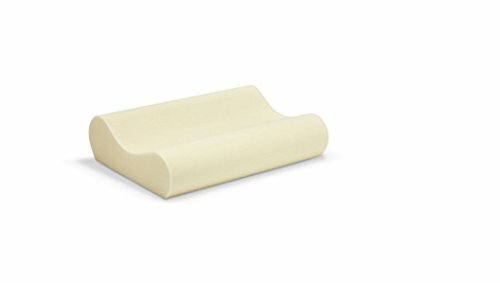 It works as both a pillow for side sleepers and back sleepers, with contouring cervical support leading to a cavity for head rest, and thick side zones for those who sleep on their sides. The Sleep Yoga is made with 45% cotton and 55% lyocell construction for its case. Cotton is a great breathable insulator with excellent airflow for cooler sleep. Lyocell is a form of rayon (but more expensive) that uses cellulose fibre found in many everyday fabrics, including in conveyor belts and medical dressings for its strength. Lyocell is soft, absorbent, durable, and resistant to wrinkles. The filling is patented, and Sleep Yoga hasn’t disclosed information about it. We think it is some sort of blend with poly fiber filling, but cannot confirm. Overall, the pillow does a good job at supporting the neck. We especially love the rounded contouring support, which may not be as thick as other pillows, but does the job well. You can rotate the pillow to sleep on a more flatter surface without the cervical support if you prefer. The side panels are also pretty sizable allowing room for side sleepers to rest their heads comfortably without falling off. We are a fan of the medium firm option, and there is a softer “medium soft” choice available as well. 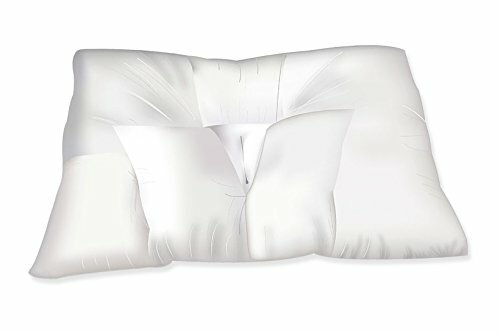 The Sleep Innovations Pillow is the best value cervical pillow, and best one that represents most cervical pillows on the market. It uses cotton casing with memory foam filling rounded on both the long side of the pillows with a cavity in the center for headrest. The rounded cervical supports are of different height, so you can switch between the two depending on your needs. The memory foam is a much denser type of foam, and unlike the other pillows we recommend, will provide the firmest support. Memory foam at first will be dense, but as heat build up, will give and shape itself to the weight and curves of your neck and head. If you aren’t a fan of filling that can shift around, the memory foam will stay as one piece so no matter how you position it, you will have consistent support. The firmness of memory foam also means your head won’t uncomfortably sink into your pillow. Overall, the Sleep Innovations Pillow does the job. If you need a firmer sleeping pillow, then this is the one for you. The memory foam conformed well to our heads and neck, and having two different thickness of cervical support gives us a chance to switch it up during the night or as preferred. There are two sizes available: queen size and standard. What Makes A Great Cervical Pillow? Actually a curved pillow. Regular pillows provide cushioned support to the back of your head. The mattress provides support from your upper back and down. What about the shoulder and neck? Cervical pillows are designed to be a contoured shape that provide support by filling the space between your neck and the mattress. Most cervical pillows have one ‘hump’ that is thicker than the other, giving you an option to pick and choose which side you prefer.There are other unique shapes available, such as a ‘v’ design or ones that use a triangular shape. Neck rolls are also a candidate for supporting the cervical vertebrae very well. Aside from the mattress, the pillow is one of the biggest choices you can make that will impact your sleep for better or worse. 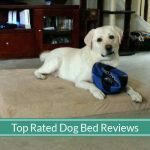 Although it’s not ideal for our budgets, we tend to recommend our readers to consider testing many other pillows in order to find the right one that is best for them. Something to keep in mind is that our preference can change over a few short years or even months. Made of material that can retain its shape. Most cervical pillows are made from memory foam, and for good reason. Memory foam is growing in popularity for its ability to conform to the shape of your body, providing support that is full contact without losing its shape. During sleep, the neck needs to be kept at a certain angle which is where a pillow comes in. 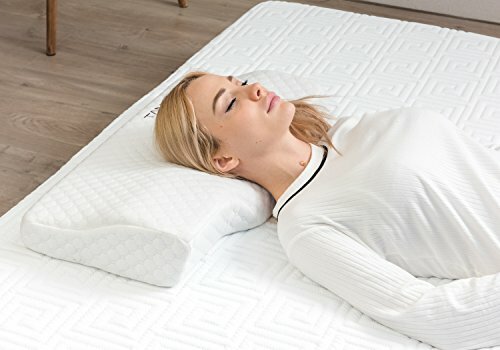 Cervical pillows made from memory foam can ensure your neck retain its neutral position, reducing pressure along your spine and your shoulders.Gel memory foam (for cooler sleep), shredded memory foam (an adjustable choice), and latex memory foams (more bounce and better airflow) are all great choices as well. Offers multiple head positions. Throughout the night, tossing and turning is expected as you adjust yourself to relieve hours of pressure on a particular part of your body. The same is true for your head and pillow. Having a pillow that offer different head resting positions can give you a greater variety and possibility of finding the right sleeping head rest. There is one trade-off to keep in mind: your pillow won’t be a consistent shape all around, which may make it uncomfortable during the night if you find yourself shifting your body in a significant way.